Crafting With Craig: Celebrate a birthday - Sue Wilson style. Celebrate a birthday - Sue Wilson style. Good evening. Well it's evening as I type this blog post. Sitting blogging this post while having a cup of hot juice (as I'm cutting down on the amount of tea I drink) and catching up with tv. First things first, episode one of season 13 of Hells Kitchen usa. I do like Gordon Ramsays shows. Anyway, I'm sure you didn't want to know all that. It's been a busy day for me, a good busy. Iv had a day of playing with some new products I have got. If your a Hunkydory fan then they have a gorgeous pick of the week launching this Friday on create and craft. I had so much fun making samples for the shows, I hope you enjoy seeing what Iv made. It's even more special as the lovely Anne-Marie is BACK on our screens. Anne-Marie has been back at HD towers a few weeks now after her maternity leave but now it's time for us to see her back on screen. It will be a cracking launch. I can tell you that it's called Butterfly Bouquet and it's gorgeous. Head across to Hunkydory crafts facebook page for some sneak peaks. Now, this card below is made using Sue Wilson Scandinavia collection that's by Creative Expresion. This is the first time I have ever used dies by both Sue Wilson/Creative Expressions and I got to say I love them. Each set in the collection mixes and matches with each other (as there's 5 sets of dies in the collection) and each set has about 5 dies in them. The versatility of each collection is quite mind blowing. I start with an idea in my head and by the time Iv finished, it looks nothing like what I had planned to do as so many different ideas pop in my head as I'm working away, so I chop and change my card layout plan. I have used many card companies over the years but have used PMD (PaperMill Direct) for quite some time until lately where I use it all the time. Not just because I'm now on their dt but because the card product is exception quality. Coloured, black or white - I go to PMD all the time. Also check out PMD website for a full range of card and envelopes that they produce from their own mill. It's really worth trying PMD linen card stock so head across and order some. White Supersmooth card - 300gsm. White linen card - 255gsm. 3D foam pad strips - S57318. 6mm double sided tape - FPAL2732625. 8x8 clear cello bag - K608. 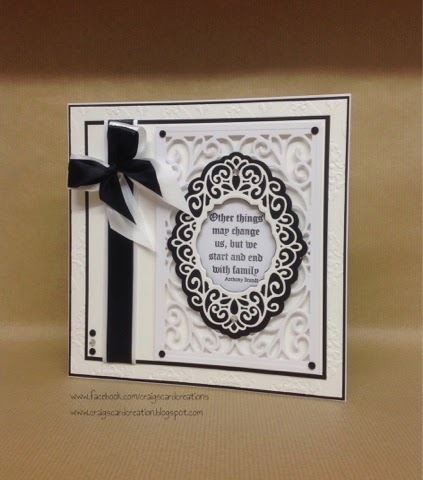 Sentiment verse - Simply Sentiments by Creative Expression. 5mm bling gems - Hunkydory Crafts. Tuxedo blank ink pad - Memento. 26mm white satin ribbon - Anita's. 19mm black satin ribbon - Own Stash. A4 embossing folder - Free one with original Ebosser. Mark a book with a little love bookmark.